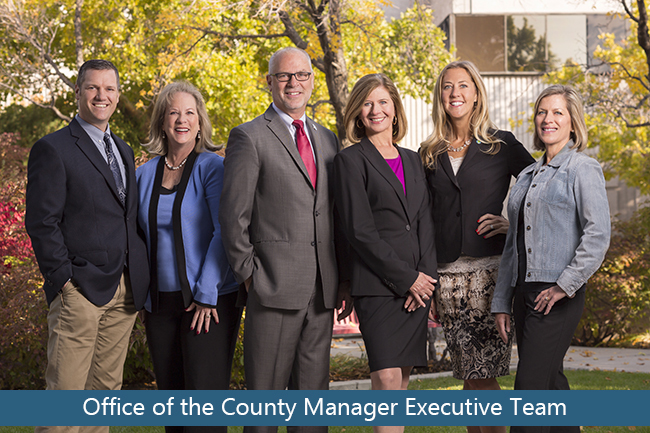 As chief executive for Washoe County, the County Manager serves as liaison between the Board of County Commissioners and elected and appointed department directors, other governmental jurisdictions, community and business groups, employees, and county customers. As with our other departments, the following roles of the Office of the County Manager (OCM), are multi-functional (see organization chart) and support our mission to work regionally to provide and sustain a safe, secure and healthy community (see Washoe County Strategic Plan). Office Administration facilitates presentation of issues to the Board of County Commissioners (BCC) for their consideration, ensures effective implementation of direction given by the BCC, and manages the Administrative Hearing Office which facilitates hearings for various code violations. They also support planning, strategy, financial management, and personnel support to the OCM and the Commission. Budget identifies revenues from multiple sources available to fund Washoe County operations, capital improvements, special programs, and debt. In partnership with departments, the program prepares annual spending plans to utilize those revenues within constraints prescribed by the BCC, state and federal law. Budget provides information to assist ongoing budget management so that we can be responsive to changing conditions and needs while remaining consistent with the sound use of resources and legal requirements. Budget also provides information related to financial implications of policy choices placing particular attention on analyzing the financial risks and rewards of different options. Our award winning communications team is a high performance group of professionals that delivers the County’s information to the public. We tell the County story through a variety of tools and creative services to ensure the message is conveyed in a strategic and relevant way. Our news happens by the minute and our award winning team works with dozens of departments, multiple elected officials, and during crisis to tell you directly what’s happening. In keeping with transparency we provide a number of ways to stay connected via Washoe311, social media, website, media partners, WCTV County news production and Charter channel 193. Special Projects provides leadership, strategic development, management and implementation of organization wide programs, services and initiatives on behalf of the County Manager. Special Projects work in partnership with the community, elected officials, and senior staff to develop solutions to emerging issues and county needs. Emergency Management maintains emergency preparedness, mitigation, response and recovery plans for Washoe County in collaboration with local, county, state and federal agencies and organizations. The program develops plans and conducts training and exercises to test emergency procedures, coordinates the Washoe County Crisis Action Team, provides administrative support to the Local Emergency Planning Committee, administers State/Federal Homeland Security/Emergency Management Grants, and manages the Regional Emergency Operations Center (REOC). Government Affairs manages issues of impact on Washoe County and promotes the County’s interests at the federal, state, regional, and local levels. The Internal Audit division conducts performance audits to assess departmental functions and processes to determine if they are achieving their intended purposes and doing so in an economical manner. Compliance audits are conducted to ensure that internal controls sufficient to ensure integrity and accuracy in financial processing and reporting are established and followed.